Blessings are flying at us so hard right now, I'm tempted to pinch myself to see if I'm awake. Some I need to keep under my hat right now, some I can share. My little guy qualified for speech three times a week through the school system. I was suspicious. I used to work for the public schools and I know at this time of the year, resources are often thin and slots for new kids far between. I figured that the speech therapist would take her time getting our intake done, then put him into speech groups three times a week, groups of course being the least effective method of treating articulation disorders. I couldn't have been more wrong. Less than six hours after gathering all of the requisite documents to register him for "school" (why can't the county agencies document share?) and filling out a ream of mostly redundant or unnecessary paperwork, the speech therapist called. She's recently dropped two children from groups and can begin to see us immediately. As in tomorrow. Oh, and he'll be seen individually all three days. Thank you, Sally. I'm going to have to learn Photoshop now that I've got a nice camera. My sister's mother-in-law made this for us. I found the toys at Target a few weeks ago on clearance. I've been promising the little guy every since that he could have them back after his party. Somehow, Mommy got an early birthday present. Got to love the internet age (and a wonderful dh and family). My sweet new Canon Rebel arrived late friday afternoon! Here we are celebrating together. 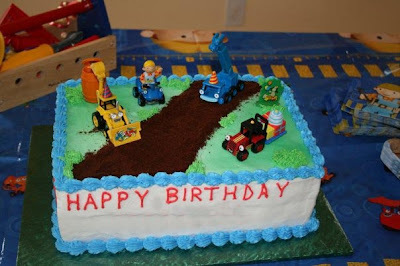 I would love to show the amazing cake my friend Pat made for him (complete with cake crumb "road" and the Bob characters in party attire), but unfortunately it had his name on the front. A SANDBOX?? For me?!? Thank you Aunt Sarah! The best. dump truck. ever. I don't make any claim to fathoming the mind of God. His ways are not mine (thank goodness), and struggle mightly though I may against this truth, His timing is perfect. 1. Several years ago, when the Princess was a tot, we were falsely and abusively disciplined by a church, and removed from leadership. Three years later, the disciplining pastor was removed from his pulpit and the associate who had been witness to the situation asked us to meet with him for a formal apology and reconcilliation. To me, three years was a long time to wait for an apology, but I finally got one when I didn't need it anymore and was able to accept it graciously. 2. The birth of our first child. I wasn't ready to be a mom, I was ready to be a professional. God knew I needed the growth and challenge of this amazing person in our lives and that a baby would bring enormous joy and comfort to our family in our season of grieving my father. 3.The birth of our second child. What did those two lines mean on that EPT just TEN MONTHS after I delivered the now TQ?? You're kidding, right God? No, He wasn't. Eeyore Jr. has been my heart's delight and his sister's best friend from the beginning. 4. The arrival of the Princess. I really, really, wasn't ready for more children, and wasn't submitting to my husband's prayerfully considered desire that we "try" for more. When I (resentfully) submitted after much stubborness, we conceived that night. She has brought so much joy to our lives. 5. Our little guy. After losses and being told there was "something" medically wrong (hmmm...could it have been cancer?? ), we were ready to investigate adoption as a means to complete our family. Two weeks later we were pregnant. The next Februrary, after many scares and medical interventions, we would have the little person who would keep us on our toes and laughing most of the time. 6. For the first seven months of his life, I couldn't get anyone to tell me what was wrong with our baby. He screamed. All the time. After pestering the medical community and wearing out our knees in prayer, we found a GI specialist who gave the little one the medicines he needed to be able to comfortably digest his food, grow, and most importantly sleep (and even occasionally smile). I learned to persisit in prayer and in hope, and to be humble in my parenting. Even with four babies, I certainly hadn't learned it all, and God used the time to make me a more empathetic person. 7. It took another six months to convince the medical community that there was still something going on with this child. God was with us as we slowly forged our way through the red-tape jungle that was (and is) the Early Intervention System in Arizona. In His perfect timing, we were blessed with some amazing therapists. 8. My cancer. I will always be grateful for God's timing in this area. My kidney began to bleed while the tumor was still well contained within the walls of the kidney. Most tumors that arise in this area aren't found until they have metastisized considerably. 9. God provided us with a blessed season of rest before our storm hit. In the months before my diagnosis we were able to spend time building our marriage up during a Weekend To Remember, and enjoyed an amazing family vacation in Lake Tahoe. I've lost count of how many times memories of this season helped sustain me during my treatment. 10. Our move. Who plans a cross country relocation in the middle of a major illness?? Evidently God does. He knew we needed a different doctor and approach to treatment and all of the family support only available right where we landed. 11.Placing the children in school. I never imagined that there would be a time that I would have peace about this decision. Believing God's timing means choosing to trust Him daily in this area. 12.The TQ's recent soccer triumph. This mom wanted so much to not see her more frustrated in an already painful season, but all of my attempts last year to "fix" the challenges fell flat. God chose in His perfect timing to show her the payoff of all her hard work and desire. 13. After two frustrating years and two state Early Intervention systems, my little guy's IEP finally sports the diagnosis that I (just his mom and an occupational therapist) had suggested from the beginning of our search for help. He's going to be able to continue with Speech through the school system and was alloted twice the number of units that I thought he'd qualify for. Kids, you didn't qualify for the Disney semifinals. What are you going to do with your day off now? We're going to the STATE FAIR! I hadn't been to the fair since an ill-fated hooky day during my Senior year and the kids had never been. So, we loaded up the van and met my mom there for a day of thrills, chills (well, not really, it was 80 degrees and humid), and of course, fair food. Eeyore Jr. tears into his turkey leg (it weighed at least a pound...where do they find turkeys that big?). He then expressed (multiple times) a desire for something "Sweet and deep fried". He certainly was in the right place. Out of a ridiculously long list of contenders (just how does one deep fry Pepsi?? ), he settled on deep fried oreos, battered and dusted in powdered sugar. If only they could put them on a stick, they would be the perfect fair food. More deep fried fun...nel cakes, that is. Chosen to pull the half hour steam whistles. They were certainly loud. The Princess getting snuggly with a pig. Sadly, it was the last day of the fair and the real piggies had gone home already. Making butter in the Ag Adventure eduacational area. I dropped the photograpic ball after the dance. If I'm honest, I'll tell you that my Cannon A95 is hoplessly outdated and not able to keep up with the shutter speed needed to get halfway decent pics of my kids on the field (Note to family and friends. I have no shame .I'm using the blog as a forum to fish for you to team up and buy me something cute and techie (with a zoom lens) for my birthday! Early would be okay, too, as round two of the Region cup fast approaches). Editorial comments aside, credit to team mom Tess for her fab photoof the TQ in action. Because of the dance, my dh and I missed my son's first round game. The report came in. They got skunked. The other team (a nationally ranked A team versus our B leauge champs) literally ran circles around them. My son gave up almost as many goals in that game than he did all of the last season. He was pretty beat up and upset. The team had to be on the field early the next morning for thier next game. Most of the boys were tired and still pouting over their loss the night before (these boys rarely lose). Their effort was lackluster and it showed in their 1-0 loss. Sunday, something changed. While they now had no chance of making the semifinals, they rallied and won a very close and hard fought game, 3-2. So why am I so proud of my son? --Friday night was a good reminder that his team needs to be challenged to get better. Very little is learned by winning all the time. His team needs to move up and work this hard every week, not just rest on their laurels while dominating the B leauge. Friday night also reminded him that it takes an entire team to win, not just the efforts of one person. He may have felt like the goals allowed were all his fault, but his defense wasn't there for him. --Saturday, the coach was upset with the boys, not because they lost, but because their heart wasn't in the game after Friday's defeat. My son was one of four boys on the roster who was recognized for not giving up and fighting through the whole game. I know this is a child who struggles with putting in maximum effort (he was the child who had to be nudged out of recreational ball and into competitive, as he was afraid it'd be "too hard and too much work"). Hearing this made me rejoice in the way the Lord is growing him in this area. --This is also my child who hates being out of his comfort zone. However, he's grown as a player this year, and after the first half of the second game, the coach put the 2nd keeper in and put him on defensive wing to strengthen the line. He hung in there and performed well in a high-pressure situation, despite it not being his favored position to play. On to the TQ. They tied one (a well matched game), they lost one (probably the result of another flat effort) and they dominated their last match from the first moment of play. They had a slim bid at the semifinal wildcard, but didn't get it. We don't talk about it much, but our last season with the local team was very rough on the TQ. She was pigenholed by a very rigid coach who only allowed her to train and play as a keeper, then criticized her skills when she was on the field (all of three minutes during the season). He also tore down her former (much beloved) coach in Arizona. Needless to say, we switched teams and clubs this season, but there was damage to repair. She lacked confidence on the field and her skills were behind the other girls. She spent most of her time in the box or on the bench. She continued to work hard, even practicing with her brother's club when her own club was off, and by the time the team came up for the first round of the Region Cup, she had gained the trust of her coaching staff. For the first time in a year, I saw my daughter on the soccer field, playing like she loved the game and it loved her. She was back in a big way. During their last rout, there was a particularly rabid soccer dad (from the other team!) on the sidelines (heck, he was so close that he was almost on the field). He was LOUD and pretty obnoxious. I fell in love with him for a moment. He kept screaming things like "WATCH NUMBER 16!! WATCH HER!". Then he'd turn to the other parents and say "She's tall and knows how to use her height. She's fast. She's watching the game ALL THE TIME and she's playing smart." Yeah, that's my girl. Welcome home, soccer diva. Really, there should be photos starting on Thursday as I ran about like a headless chicken, or more closely like a Mommy who forgot that just seventy-two short hours after she stepped off a cross country flight had to drive soccer carpool in the worst traffic conditions of the year and then host the youth group for a Valentine's Day chocolate foundue extravganza. Everything fell into place at the last minute, but I sort of forgot to bring the camera out. Friday was equally crazy as I tried to decorate six dozen cookies for the Princess' school dance and shop the after Valentine's sales for half priced candy (we did a really cool "open candy bar" where the girls got to make their own treat baggies). I got some strange looks as I loaded a cart with about $75 worth of lollipops, candy hearts, licorice whips, and chocolates. I crammed in an appointment, drove through and fed the little guy on the run, then rushed to school to set up for the dance. My husband came and relieved me of kid duty around 3:30 (bless him) so I could finish up, run by the florist, grab a caffiene fix and then head home to set up (bribe with a friend and delivered Chinese food) the TQ to watch her youngest brother, get our son shipped off to the soccer coach's house (he had a 7:45 tournament game), and then act as hairdresser/personal assistant to the princess. I DID actually remember to pull out my camera at some point here. Isn't she lovely? She adored her corsage, and once again was declared a "crincess" by her exuberantly admiring little brother. Her hot date. What a cad...would you believe he came with the blonde but hit on the redhead who was tending the "bar"? She's got her goodie bag from the candy bar next to her here and is making a bracelet. I love how this picture shows her 'do. I put so much stuff in it that it could hold up to a wind tunnel. The PTA Possee aka Dance Committe Extraordinare celebrating after breakdown. I'm in the back row to the right of the photo. 1. For Niki: Thanks for opening your home for Girls Night Out last Thursday. It was so sweet and refreshing to hang out with my Phoenix friends. You are a lovely and gracious hostess and a good friend. 2. For Sally: Thanks for being my "Jonathan". Friends that are held in the heart can never truly be separated by distance. 3. For Wendi: You're the taxi driver with the mostest....and Grimaldi's too, yum! 4.For Kim: I'm thinking of you today and praying. May you be embraced by your First Love's strong arms and draw from Him the strength to stand. 5.For my Mother and Father In Love: Thank you for letting me take a few days off from being "Mom" and put some overtime into my "Friend" job. Grandma may "rule", but it takes a set of grands to truly turn on the best kind of spoiling. 6. To my lurking readers who came out of the closet last week, thank you for reminding me that I write for more than myself. 7. For Keith and the gang at ACWI...I'm still stunned at the seeds you planted last Sunday. They're the best kind of "heart chocolate"! 8.For my sister: Sweet, tiny, valentines for a sweet, tiny new person to join our family in the fall. We are all over the moon for you and yours. 10. Sweet Eeyore Junior: Time to knock the bushel off that light, 'cause it shines so beautifully. Good luck conversation hearts to you and to your big sis at the BIG Disney President's Day Tourney this weekend. 11. Princess Pig (Cu-pig? ): You looked so beautiful in your red and pink today! I can't wait to see you step out with Daddy tomorrow night for your big dance. 12. Little Guy: You keep me on my toes, and most of the time I can laugh about it. You are now and always my favorite February blessing. 13. To the Valentine who started it all: I love you. Don't get trampled by the last minute crowds at the mall today! Mmm...and this Cappucino girl will be swilling Iced Blendeds from the Coffee Bean in Phoenix in just a few days. My flight arrives at ten...I wonder how late the drive thru window in Glendale is open?? --Getting caught in a huge traffic jam on the interstate. Trust me, as much as I've driven to Moffitt, I've got it timed to the minute, and my one hour, fifteen minute drive turned into a full two hour commute. --Dashing upstairs to Radiology to get my contrast and go through the usual motions of being "polite but very firm" about getting my hep lock before I started drinking the (ugh) contrast laced Crystal Light. The IV only took two sticks--hooray, but they had to put in a smaller gauge needle than was desirable. --The lab receptionist jumping up and hugging me when I was able to tell her, "No, Kathy, I DON'T have a port anymore." --The man next to me in Radiology sharing (out of the blue) about his rare form of Non-Hodgkin's Lymphoma. He has been battling for 8 years and 5 rounds of chemo, and his remissions keep getting shorter. He was so sad and matter-of-fact when he told me "I think I'm on my way out. I don't really want the bone-marrow transplant they're pushing on me". I didn't have time to do more than listen to him before his name was called for his test. I'm praying that he just needed someone to listen to him, and that it brought him some comfort that day. --The automatic voice in the CT machiene had been reprogrammed from my last scan. It is now a veddy veddy proper British man requesting that one "Take a deep inhale and hold your breath"...then commanding that "You may carry on breathing". Do you know how hard it is to hold your breath when you want to giggle? --The CT snafu made me late to clinic. It was nice to see the MA and my favorite receptionist, Margie...both asked about the kids and complimented the slowly returning 'do. Margie made me promise to come back by and give her the scoop after the checkup. --I saw the new oncologist about an hour and a half after my scheduled appoinment. This is not unusual. He's nice, but I miss Dr. D'A....we just have more history together, and she doesn't have a thick Italian accent to navigate. Emory is lucky to have her. --I stopped in Plant City on the way home and grabbed a flat of strawberries. It was only after I had devoured a pint of them did I realize that I'd been fasting since 7 that morning and was really, really hungry. Next stop, some protein. By the time I got home, I was ready for the couch and a hot bath. Hooray for a family content with leftovers for dinner. I thought the emotional hangover was done. I dragged myself out of bed this morning and headed out to the mall to return some pants for my little guy. We walked around, grabbed a coffee, played in the play area, and then exchanged the pants. After all this was accomplished, we hit the family bathroom, where I glanced in the mirror and noticed that I'd been wearing my sunglasses. Indoors. All morning. I wonder if people thought I was a celebrity mom gone slumming or just a really big dork. At least I'm a cancer-free dork. My Princess is gearing up for a Father-Daughter Dance to be held the week of Valentine's Day. Finding nothing suitable in her closet and not much at the mall, we picked this online. It arrived at our house yesterday. As she swooshed around the house in her crinkly crinolined glory, my little one followed her. "Oh, H! ", he exclaimed, "You look yike a CRIN-CESS! ".